I am of course a big fan of Jeff Lemire and have also enjoyed a variety of Valiant titles. 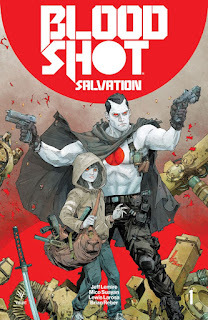 I've dipped my toe off-and-on into his, "Bloodshot," work and the latest series, "Bloodshot: Salvation," is both quite accessible to newer readers and a solid continuation of what he has done before. With great artwork by Lewis LaRosa and Mico Suayan, the story jumps around a bit from a clearly unpleasant future to a currently-mellow present. Bloodshot has settled down with a lovely woman and had a child, all is well, and Lemire makes it clear that ain't gonna last. I appreciated that the book laid-out everything from past books even if it resulted in us having to read a bunch of exposition--still, I would rather have things be a tad wordy and make sense than suffer being real confused. Plus, as a first issue it makes sense that we need to establish the foundation of what came before and the trouble that will also be on its way. I also really liked how the art/artists change depending on if we are looking at the upcoming future or back in the past/present. The smooth and flowing look of the present has a good counter to the more harsh and scratchy artwork in our glimpses of what is to come. "Bloodshot: Salvation," is both a great continuation and a solid start to the latest comic starring the titular hero. 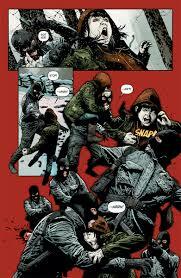 Lemire is a superb talent and the artwork meshes with his writing fantastically (if that's a word). I'm already eagerly awaiting the next issue and award this a glowing 4 out of 5 stars. You can find the new, "Bloodshot: Salvation," at Things from Another World or as always eBay is a stellar resource.